AppInventor.org is a site for learning and teaching how to program mobile apps with MIT's App Inventor. These tutorials are refined versions of the tutorials that have been on the Google and MIT App Inventor sites from App Inventor's inception-- thousands of beginners have used them to learn programming and learn App Inventor. This site is also designed for use by teachers. The teaching materials here have been used as a basis for numerous middle school, high school, and college courses. The course-in-a-box, which is based on Wolber's USF courses, provides structure and material to get a new course up and running within days. Your guide in these pursuits is David Wolber, Professor of Computer Science at the University of San Francisco. Wolber began teaching App Inventor as part of Google's 2009 pilot program and has taught more App Inventor courses and workshops than any human alive. His USF course, "Computing, Mobile Apps, and the Web", has served as a model for teaching non-CS-majors and interesting them in computing. The apps created by his students -- mostly humanities and business majors with no prior programming experience -- have been chronicled in several articles shown below. In 2010 Wolber received a grant from Google to work with the App Inventor team and author the original advanced tutorials that appear on the App Inventor site. In 2011, Wolber's book App Inventor: Create your own Android apps was published by O'Reilly. 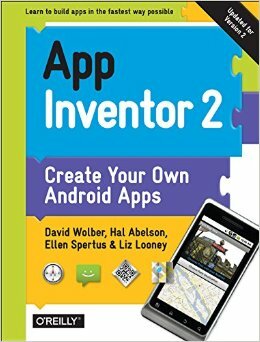 In this book, Wolber teams with MIT Professor and App Inventor creator Hal Abelson as well as Ellen Spertus and Liz Looney from the App Inventor team. This book is available in paperback at Amazon and on-line for free here at appinventor.org. In 2012, Wolber was part of a collaborative project awarded a National Science Foundation TUES grant (Transforming Undergraduate Education in STEM). The grant team, including USF, MIT (Abelson), Wellesley (Franklyn Turbak), UMass-Lowell (Fred Martin), and Trinity College (Ralph Morelli), is tasked with developing materials for teaching mobile programming to beginners.